Snow blindness is a potentially serious medical condition known in medical speak as “photokeratitis.” Essentially it means “sunburned eyes.” While snow blindness can be immediately painful and cause a temporary loss of some visual functions, the long-termed threat of prolonged UV damage to the cornea is no less than absolute and incurable blindness. Custom “snow goggles” are therefore essential for Alaskans who travel outdoors and who wish to protect their eyes. 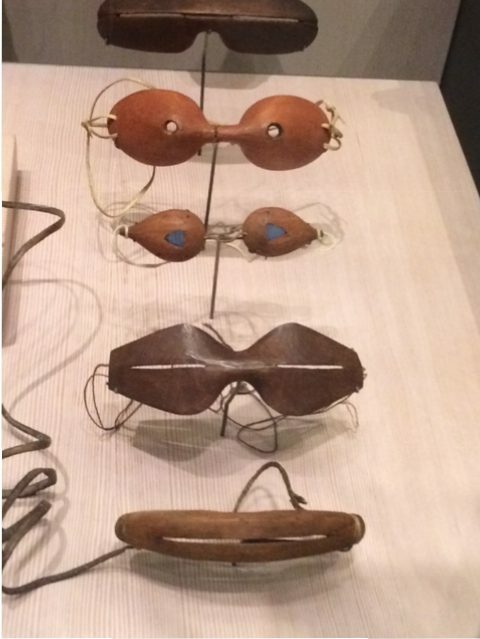 Traditional native “snow goggles” restricted UV flow to the eyes by making either a small slit or tiny holes in a piece of wood or bone which was custom fitted to the face of the person who would wear it. 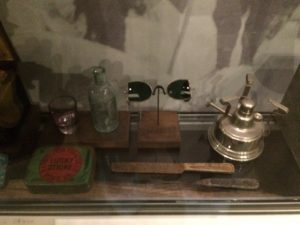 Specially created to lessen the UV intensity of light, modern sunglasses have been adopted by many in the Yup’ik and Inupiaq communities for use in hunting, travel, etc. However, for reasons primarily of cost and access to cash money, the older style “snow goggles” continue to be made and used in the Alaskan West and North. 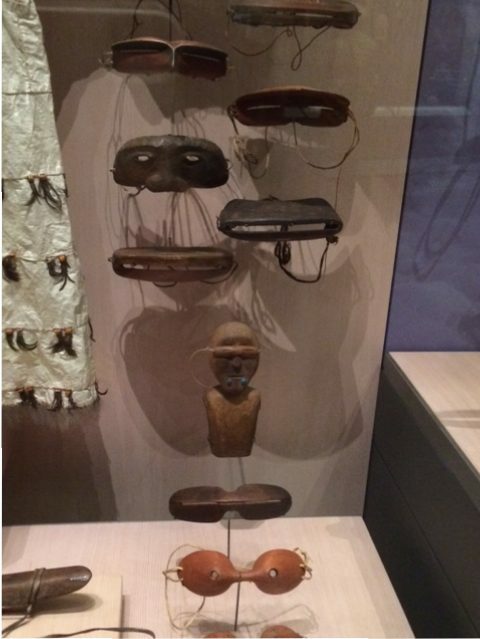 Thus, like certain other traditional native technologies, they continue to exist and be used alongside the technologies of the Western world. In everyday life, many inhabitants of Northern and Western Alaska have adopted glasses with “transitions” lenses for short journeys outside or travelling between houses. It is only for longer distance journeys that snow goggles or glacier glasses will be used. 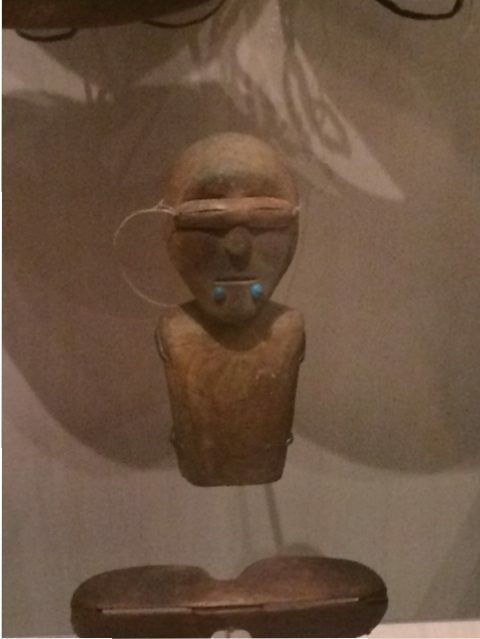 All images of artifacts in this post were produced courtesy of Alaska State Museum – Juneau. This is a fascinating post. When I was teaching in Nunapitchuk, I chaperoned a group of students for a “Future Problem Solving” competition. We travelled to Atmautluk by snowmachine. I was driving and was the only person wearing goggles. It was very windy and the temperature was something like 30 below. When we arrived in Atmautluk, I had frostbite in rings around my eyes where the goggles didn’t protect my skin. The kids were laughing and said that I looked like a raccoon. Nice work. I’m having a pleasant virtual visit to the SLAM facility this afternoon.